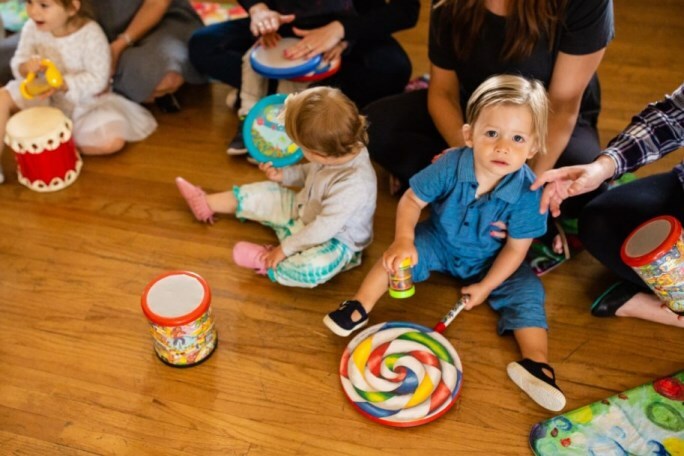 Musical Parties are so much fun for both children and adults. The session lasts about 45 minutes. First we sing hello to all the children by name. Next we go through a set of songs, some familiar, some new, some requests, but all simple and easy to follow along with. Some songs will have movements that go with them; other songs will be sung while playing child-friendly instruments. We will dance with ribbons to fun, upbeat songs. The highlight is the jam session toward the end of the program where everyone at the party finds an instrument to play from the assortment and we all jam together. We finish with the goodbye song and a grand finale of "Happy Birthday" to the birthday child. Our music specialist brings all the instruments, props and music. $200 (birthday child will receive a $25 It's Groovy Baby class gift certificate and each child attending will receive a $10 gift certificate for a future It's Groovy Baby class. It's a blast for everyone at the party.